Artist Unplugged: Ta Da !!!! Finally! This is my very first canvas painting in about 30 years......during that time, I had worked a few years as a graphic artist until I had BigBoy. Many a backdrop for plays, huge wall paintings and characters created for bible school and dinner theatres. Even got into the painted clothing craze back in the 90's. Wow, I sound so old......just experienced and wise......uh, um, yeah, that's right.....I'll go with that. 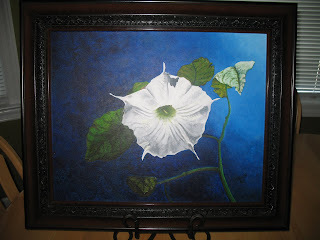 This painting was put in the silent auction for VolleyGirl's high school big fundraising event. I must get one painted for the middle school event as well. I did purchase a portfolio case and have my photos ready to be printed today. It is only 8 pieces but all the businesses say to bring by a portfolio and so...........I think I can sell myself, confidence feeling pretty good right now. I am coming to you live from the sweet laptop SuperSpouse secured for me.....finally has my email addresses on it and all. Don't have my favorites list, but that will accumulate. That does it for the moment, I realize one can only take in so much excitement, and must be taken in small increments. Hey, if you're visiting, leave a message.....doesn't even have to be nice, I can take it.......knock, knock, anybody there? You get the idea.